Our next 15-week paid FutureCycle training program still has 2 spots open! We are recruiting four youth, 16-24 who think bikes can change lives, are interested in teaching, aren’t afraid to get dirty, aren’t afraid of a challenge, communicate well, and are curious and excited to learn. Details and how to apply here. 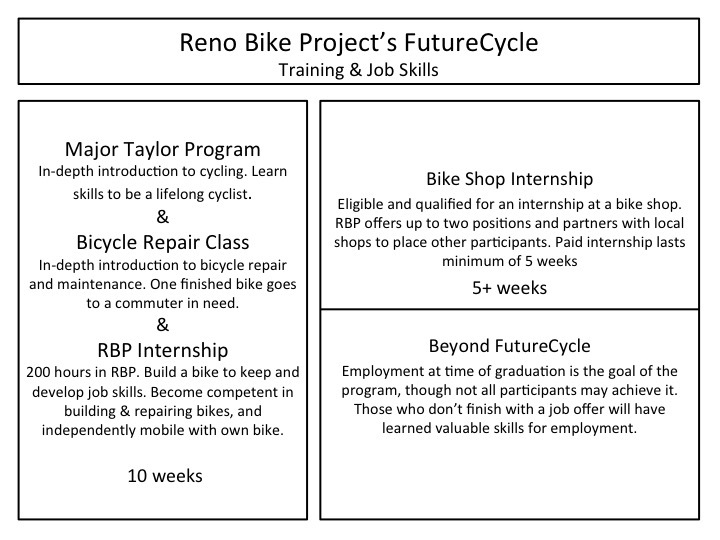 The Mission of the FutureCycle Program is to use the Reno Bike Project as a setting to teach at-risk youth the skills needed for a lifetime of employment. FutureCycle equips youth, who face barriers to success, with skills to be employable in any bike shop or other specialty retail, through 15 weeks of paid training and internship. FutureCycle also illustrates, through experience, that the bicycle can be used as a means to financial success, a form of transportation, and a medium to gain mechanical and problem-solving skills. Drawing on existing programs that teach safe riding and bicycle repair, we incorporate job skills training such as resume building, interviewing, customer service skills, and more. Participants start the program with training in the fundamentals of safe riding and in-depth bicycle repair. They rebuild a used bicycle to commute on and keep after the program, and continue to build and refine their skills. Participants finish the program with a 5-week externship with a partnering bike shop in town. Upon graduation, it is our goal to have produced highly desirable bicycle shop employees with relationships and references from RBP and the partnering shops. FutureCycle is a broad community-based initiative. FutureCycle began in Spring 2016 in partnership with the Children’s Cabinet, under a grant from the Department of Labor for job skills training. Our partnering bicycle shops are Sierra Cyclesmith and Velo Reno.